Multi-wavelength view of the region around Kes 78. The radio shell of the SNR is shown in the upper-left panel, and is overlaid on the CO image (upper right), as well as on the smoothed ROSAT X-ray count map (lower left) and on the H.E.S.S. gamma ray significance map (lower right). The white circle illustrates the H.E.S.S. angular resolution. Kes 78 - also known as G32.8−0.1 is an elongated shell-type supernova remnant (top image, and Fig. 1) at an estimated distance of about 9 kpc (Xu & Zhang 2009). Maser emission is detected on the rim of the remnant (Koralesky et al. 1998), indicating that the supernova shock runs into a cloud of molecular gas, as observed also for other remnants such as W28 or W51 (see SOM 5/2009 for more details). In maser emission, the shock wave pumps OH molecules into excited states from which they decay by radio maser emission. Maser emission is an important tool in establishing that a supernova shock actually hits a molecular cloud, as opposed to an accidental overlap along the line of sight of two objects at different distances. Supernovae interacting with molecular clouds serving as targets for accelerated cosmic rays form an increasing class of objects helpful for studying particle acceleration. 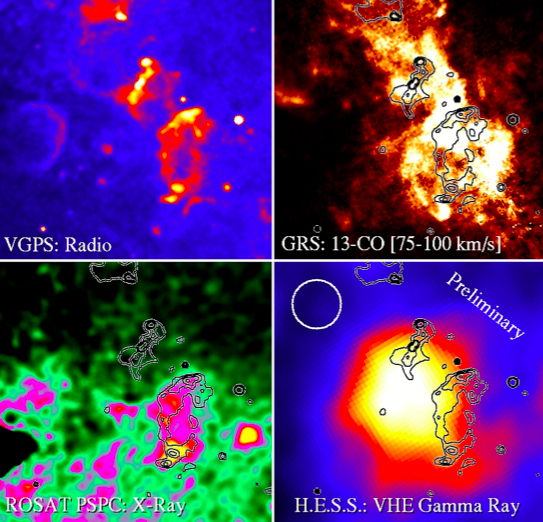 In 45 h of data collected between June 2005 and August 2008, a highly significant gamma ray source - HESS J1852-000 - emerges near Kes 78 (top image, bottom right panel, and Fig. 1). The very high energy gamma ray source is clearly extended. It overlaps partly with the Kes 78 shell as seen in radio, and with the molecular cloud seen in CO radio maps (top image, top right panel). 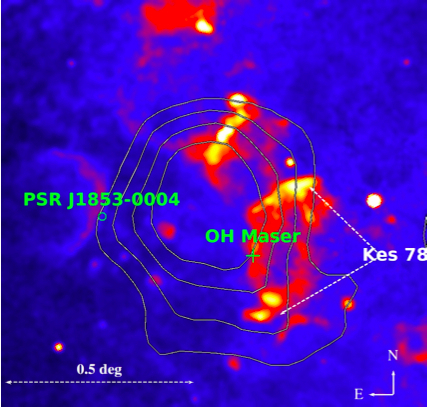 That the gamma ray emission results from cosmic rays accelerated in the remnant shell and interacting with the molecular cloud represents a very plausible scenario; an alternative explanation is that HESS J1852-000 represents a pulsar wind nebula driven by the pulser PSR J1853-0004 at a distance of about 7 kpc; however, while gamma ray sources are frequently somewhat offset from their parent pulsars, the large angular distance of 0.5 degr. (or 60 pc) observed here renders this explanation unlikely. Fig. 1: Radio image of Kes 78 and surroundings with contours of the H.E.S.S. gamma-ray source overlaid in black. Also marked are the positions of the maser emission and of the pulsar PSR J1853–0004.